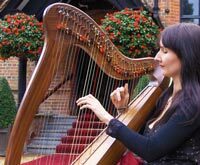 Here is a guide to where it is customary to have celtic harp music at a wedding or civil ceremony. Ramona is always happy to discuss and work with your plans to make it ‘your’ special day! How far are you prepared to travel? Do you charge travel fees? I am a full time professional musician and I frequently travel across the UK. I generally drive to and from a booking on the same day, only charging fuel costs in addition to the music fee if required. If the event is at such a distance that it necessitates overnight accommodation I include a bit extra for B&B. I also sometimes perform abroad. I arrive at the venue a minimum of an hour before the event to allow plenty of time to find out where I’m playing and to set up and tune up. What type of harp and music do you play? 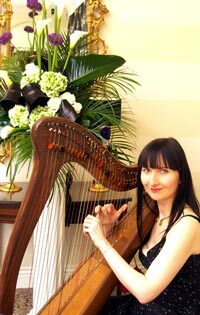 I play Celtic harp, which has a very personal, romantic, intimate tone. Made by Pilgrim Harps who are well established, high quality harp makers whom I recommend to my students when they are choosing a new harp. I play a mixture of classical and Celtic music and some renaissance pieces. 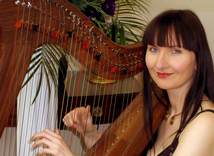 What is the difference between Celtic and Classical harp? They sound very similar but the main difference is that orchestral harps have foot pedals for changing key, whereas Celtic harps have semi-tone levers. I have a lever on every string which means I can play in any key and often change key whilst playing. Celtic harps are very portable as they are smaller than orchestral harps. This can be very useful at weddings if required to move to different locations during the course of the day. Is your celtic harp loud enough for outdoor events? I often play acoustically, especially for wedding ceremonies, but I also can use high quality, compact amplification equipment for larger outdoor events or during the drinks reception or meal when required. Do you have PAT testing and Public Liability Insurance? Yes, my equipment is annually PAT Tested and certificated. I am a member of the MU with full Public Liability Insurance - £10,000,000. Looking for music for the evening celebrations? Ramona can also offer various options for the evening entertainment; co-ordinating your music throughout the day and evening into one cohesive music package. Ramona sings and plays fiddle and whistle in various professional bands. Whether you are looking for subtle background music, lively jigs and reels or a ceilidh / barndance with a caller, Ramona can advise you and make all the arrangements required to continue the Celtic flavour and flow of your special event. Experienced at organising events; Ramona is also a member of the Musicians Union and has full Public Liability Insurance and high quality PA equipment which is PAT tested.